The French Football Federation have opened disciplinary proceedings against four members of France's Euro 2012 squad. Samir Nasri, Hatem Ben Arfa, Jeremy Menez and Yann M'Vila will be called before the FFF's disciplinary committee for a variety of offences committed during the tournament in Poland and Ukraine, which France exited in the quarter-finals. Manchester City midfielder Nasri fell foul of the FFF following his heated argument with a journalist in the wake of Les Bleus' last-eight loss to Spain, while Newcastle forward Ben Arfa was allegedly embroiled in a dressing-room altercation following the 2-0 defeat to Sweden in France's final Group D outing. Paris St Germain midfielder Menez is to be investigated after allegedly gesturing at goalkeeper Hugo Lloris, while Rennes midfielder M'Vila upset the FFF when he blanked coach Laurent Blanc following his substitution against Spain. The unsavoury claims have brought back memories of France's disastrous 2010 World Cup, when Les Bleus crashed out at the group stage after the players refused to train following the expulsion of Nicolas Anelka. On that occasion, Anelka, Patrice Evra, Franck Ribery and Jeremy Toulalan were hit with bans of varying lengths by the FFF. Meanwhile, Le Graet revealed that it could still be another week before the FFF announce their successor to former national team coach Blanc. Blanc announced at the weekend that he had decided against renewing his contract with the FFF after presiding over a disappointing Euro 2012 campaign. Didier Deschamps was immediately installed as favourite to succeed Blanc and appeared a certainty when it was announced he had left his post at Marseille by mutual consent. Reports in France this morning suggested Deschamps, having met with the FFF, had decided against coaching the country he captained to World Cup 1998 and Euro 2000 success. 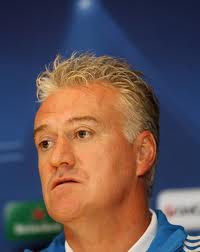 But Le Graet is confident a deal for Deschamps remains on the table. 'I saw this morning that Deschamps had said no. That's a mistake. He's a boy that I would like to work with,' he said. 'Everything is possible. Wait patiently another week. I saw Didier Deschamps last night briefly. The proposal was made. He confirmed that the France team was part of his dreams. Alternative candidates under consideration by the FFF include Oman boss Paul Le Guen and Francis Smerecki, who has worked extensively with France youth teams.